As soon as spring comes around, I run out and get some wild flowers. Here in Spain, they grow wild everywhere. In 2016 there were flowers everywhere, it was an early spring and it lasted a long period. Everything seemed to be in bloom at once. In the evening the colors change, the flowers, the glass, the intensity, lots of things. This is the same scene as above but at dusk. Daisies, Spanish Poppies and Wild Flowers are my favorites. I like to place the poppies and glass work in different areas of the house to see how the light works. Here, the poppies and little wild flowers were up against a window for full light and color. I love painting bougainvillea, the color is so intense against the green leaves. I painted this little watercolor in my Mother’s garden. These roses are also from my Mom’s garden. It’s so pretty. I like this blue bottle because of the color and transparancy. Whenever I go to California, I pick up a few bags of wild flower seeds and sprinkle them in the flower pots on the terrace. These are the California Wild Flowers that were growing on the terrace. Pink, blue, violet, purple, yellow, crimson and white dainty-looking flowers. I remember when I painted it, watching the flowers grow and bloom on the terrace. At Mom and Dad’s place, I love to paint my Mom’s garden; she has a green thumb. The garden is so pretty. I have a small glass work collection of bottles and vases. This red bottle is so pretty, I painted it with California wild flowers. I got roses growing on my terrace too. This is my favorite vase. It’s called an ewer. I like to paint glass and flowers reflected in the mirror. This beautiful Talavera vase has a special sheen, a glaze typical of the old factory which burned down long ago in a fire. I never get tired of painting it in the spring with wild flowers. I like painting glass, so I have quite a few bottles. They are my favorite bottles and have painted them many times in different places and lights. Here I painted them in the rain. 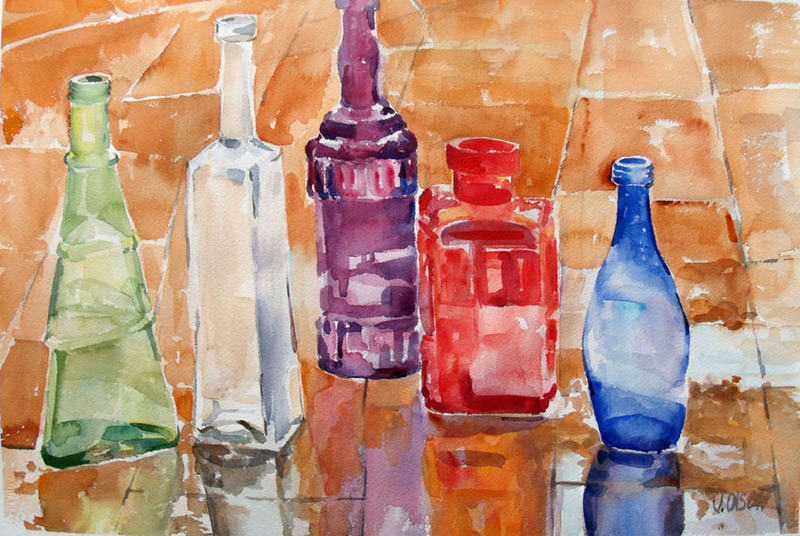 This watercolor with the pear and bottles on the kitchen cabinet is part of a collection called my favorite bottles. The bottles looked so luminous ontop of the closet and I really liked the design on the top of the antique closet. Here the bottles are on top of a black shelf with the light coming through on the right. on the form below. Back to Art Shop.